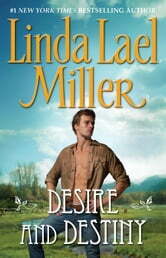 Weaving a bright passion with the dark currents of past secrets, bestselling author Linda Lael Miller tells the tale of star-crossed lover bound by Desire and Destiny. Devastated by the loss of her father, lovely Brynne McFarren returned to the Washington coastal town of her youth. Brynne was surprised to discover that her family name had a dark notoriety...and alarmed to be caught in a triangle of sudden desire.